Gregory Behle, Professor at The Master’s University in Santa Clarita, California, and kick-off presenter of the Archives Sesquicentennial Speakers Series, March 2, 2017, authored this post at the request of the Student Life and Culture Archives to commemorate the 150th anniversary of the first day of class. Behle’s research focuses on accessibility, student life, and campus culture at the University of Illinois from 1868 to 1894. Slides from his 2017 presentation are available HERE. 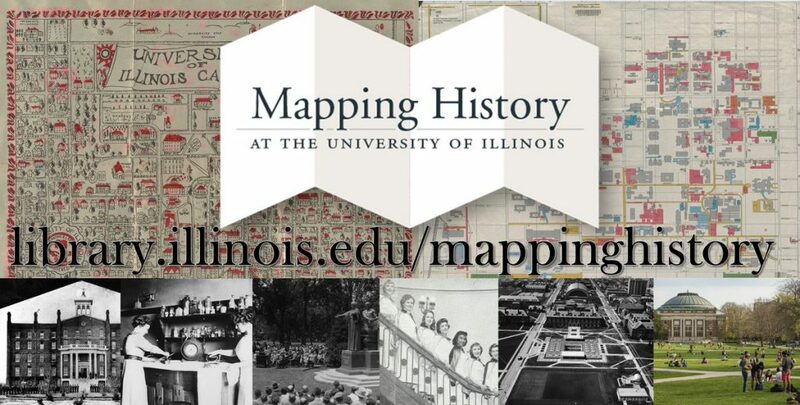 For more information about campus during these earliest years, see the Archives’ Mapping History at the University of Illinois project website, including interactive histories and maps and a campus and community map digital archives. Between 50 & 60 students appeared on the ground[s] this morning. Fine energetic young men. More are coming with every train. John Milton Gregory to Mason Brayman, March 2nd, 1868. 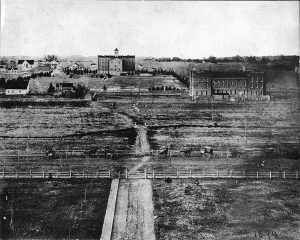 Photo shot from south of Green Street looking north across Green Street, the Silver Creek (Boneyard Creek), and the Champaign and Urbana Horse Railroad with the University Building (‘The Elephant’) in the center-left of the background and the old Mechanical Building in the center-right. 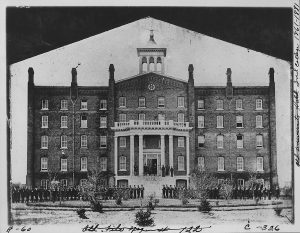 On a Monday morning, 150 years ago, the Illinois Industrial University opened its doors for the first time to prospective students. On that day, over fifty Illinoisans arrived from across the state – some traveling in the company of parents, others arriving by trains or buggy; most were local Champaign county residents. For the new Regent, it was a full day of presidential duties. John Milton Gregory had been racing to get the University open one year after its founding in February 1867. For him, March 2nd was a whirlwind of activities. He was busy welcoming new students including James Newton Matthews, the University’s very first student who had arrived with his father on opening day. There was a university trustee who was hostile toward the intent of the new university and using the press to dissent. The backroom debate over the mission of the university was reaching a crisis point and a major distraction. There was an upcoming trustee meeting and the March 11th inauguration at which Governor Oglesby and other and state dignitaries would be attending. He faced the challenge of finding qualified faculty and outfitting the university. Finally, Gregory must interview students as to their qualifications for admission. For the president, it was a full day of activities. The candidates who arrived on March 2nd were about to enter a new world. Illinois Industrial University was to be an innovative college with a new kind of curriculum. Like today, the young students made new friends, got acquainted with their new surroundings, moved into university housing, and unlike students in 2018, they had to qualify through personal admission examinations with Dr. Gregory. Arriving by rail, students transferred to the University which was located in a remote part of the Illinois prairie south of the towns of Urbana and Champaign. Isolated from the twin cities, their new life would be simple at best. 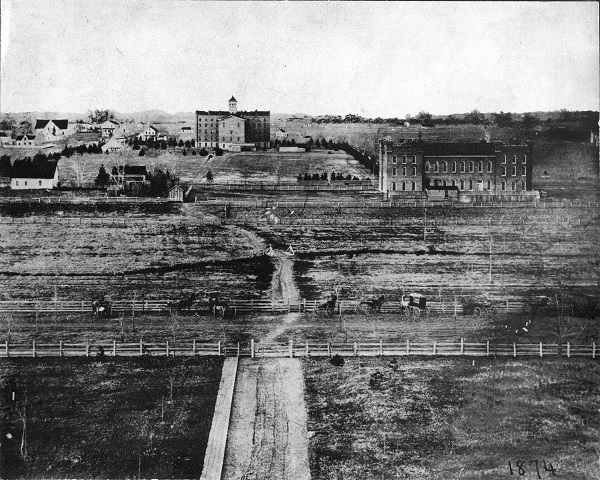 Nicknamed “Oklahoma” for the flat, desolate, and muddy location – students were sequestered from the allure of city life. In theory, the remote location was meant to encourage scholarly activity in the absence of urban distractions. If the location itself was not unsettling, the new university lacked a library, laboratories, and, for the most part, a faculty. 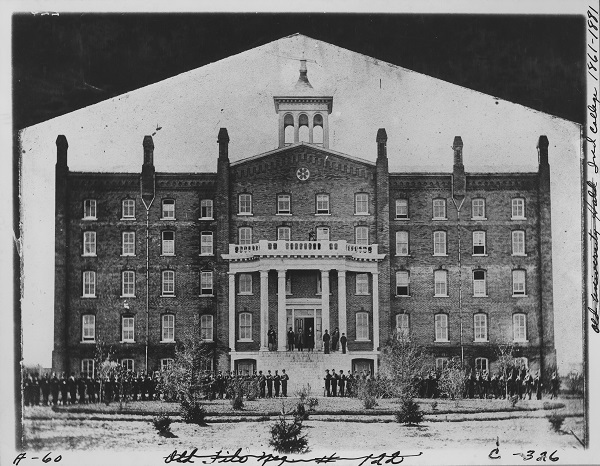 With the university opening only a year after its inception, Gregory had scrambled to cobble a curriculum that would be acceptable to all interested parties. Bare bones accurately described their new home. Everything was in process. The admission examination determined their enrollment in the new university. Students were ushered in groups into Dr. Gregory’s office where they sat in a semi-circle manner facing the Regent. An oral examination on subjects relevant to the university curriculum was given to determine their qualification for admittance. Gregory was marked by a benevolent spirit. Students performing in less than satisfactory levels were allowed grace through higher scores in other categories – balancing out their less than stellar performances. Many students expressed their fears of facing the Regent but found that he possessed a kind and gentle spirit. The cost of attending Illinois was a problem for many. Early tuition structures placed costs at $163 to 195 dollars for the year (room and board combined) (about $16,500 to $20,000 today). For a typical laborer, this was far more than they could afford on an average wage of $1.50 to $3.00 a day. 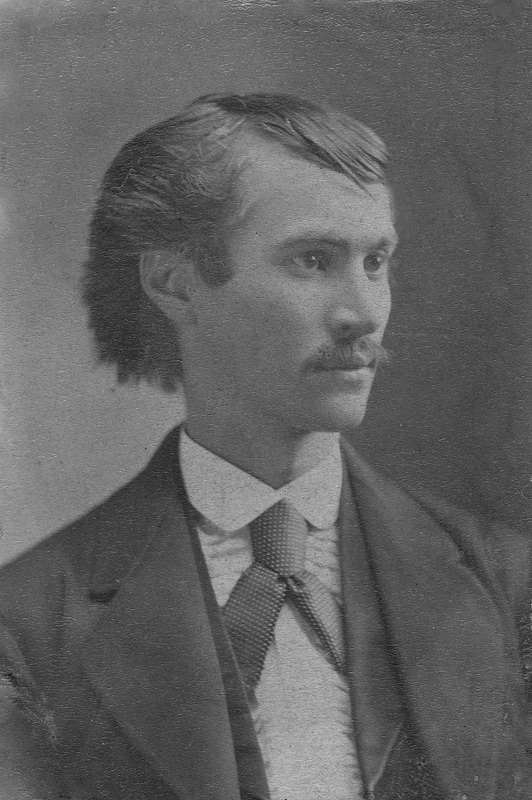 James Matthews soon wrote his father that he had purchased a botany textbook for $3.50 – two days’ wages in 1868. Like today, students moved into on-campus housing on opening day. Rooms where small (14 by 10 feet – housing two students) and empty. Students had to secure all the furnishings necessary to equip their rooms. Coal stoves were purchased for heating and cooking. Students procured beds and bedding, coal, kindling, dishes, kettles, pots, pails, basins, pitchers, tubs, lamps, oil cans, books, food, and clothing to outfit their new domicile. Local Champaign and Urbana merchants began to realize the economic value of the new institution. Many who arrived the first week relished the idea of missing spring planting and farm drudgery. Others explored the twin cities – discovering the saloons and billiard halls to the consternation of the faculty. Like students from other colleges, evening entertainment included whist parties and pranks. “John Milton Gregory to Mason Brayman.” 2 March 1868. RS 2/1/1, John M. Gregory Papers, University of Illinois Archives, Champaign-Urbana. Behle, J. Gregory. 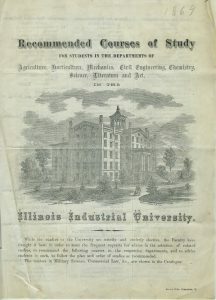 “Educating the Toiling Peoples: Students at the Illinois Industrial University, Spring 1868.” In The Land-Grant Colleges and the Reshaping of American Higher Education, edited by Roger L. Geiger and Nathan M. Sorber. Perspectives on the History of Higher Education, 73-94, 2013. ‟Gregory and Early Recollections – Brown, Ralph L., 1918-20.” RS 35/3/125, University of Illinois Early History, 1853-1962. University of Illinois Archives, Champaign-Urbana. “29 April 1838” “Francis Plym File” RS 26/4/1 Alumni and Faculty Biographical (Alumni News Morgue) File. University of Illinois Archives, Champaign-Urbana. 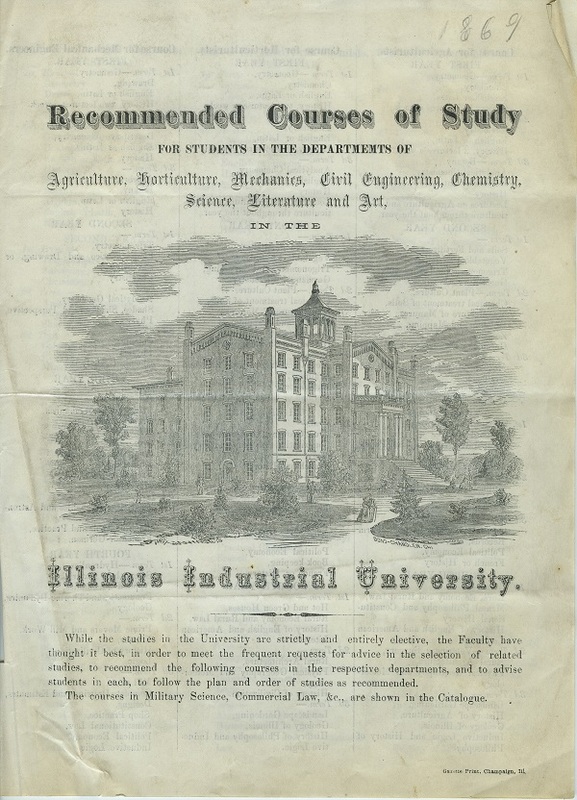 Circular and Catalogue of the Officers and Students of the Illinois Industrial University. Chicago: Church, Goodman and Donnelley, Printers, 1868. “James N. Matthews to William Matthews “ 15 September 1868. RS 41/20/26. 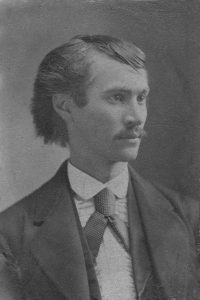 James N. Matthews Papers. University of Illinois Archives, Champaign-Urbana. 28 March 1868. RS 4/1/1 Faculty Record. University of Illinois Archives, Champaign-Urbana. 23 November 1868. RS 4/1/1 Faculty Record. University of Illinois Archives, Champaign-Urbana. “A Toast to the Past.” RS 41/20/26 James N. Matthews Papers. University of Illinois Archives. Urbana-Champaign. This entry was posted in FAQs, Found in the Archives, Research, University Trivia. Bookmark the permalink. Trackbacks are closed, but you can post a comment.